Emily Eaton was born with a severe form of cerebral palsy (CP) and had many physical challenges. As a young child, her body was “floppy,” but she eventually defied doctors predictions and learned to sit, feed herself and walk with a special walker and leg braces. She uses a wheel chair. Verbal communication was difficult, although she learned to communicate with facial expressions and body language. Emily also had visual difficulties. Because of her special need for therapy and teachers, Emily had attended a school for children with disabilities. But at age five, her parents decided to enroll her in a public school so that she could interact with other children and become part of the community in which she lived. Emily was nervous at first, but grew to love her school and new friends. She attended school two years before the board of education intervened.Little did Emily know she was about to face a great challenge in her life — a school system that only saw her disabilities and not her abilities. She was denied access to her second grade class. This very strong girl only wanted the right to attend school like a regular kid. With the support of her family, Emily confronted the local board of education first. This courageous girl ended up taking her case to the Canadian Supreme Court in the late 1990s. Her fight became a battle for all children with physical and mental disabilities to have the right to be included in public schools.Kathleen McDonnell has written an inspirational narrative about Emily’s remarkable journey to attend school with non-disabled children. What I found fascinating was that Emily’s teachers and students found how much they benefited from her participation in school. They all worked together as a team and enjoyed her presence in the classroom. Teachers reported here were so many valuable lessons for everyone involved. Her inclusion in school was groundbreaking for a child with severe CP in the nineties. According to the author, there is still a lot of work to be done because ”resources and funding remain major roadblocks to facilitating these rights in classrooms today.” Emily however, graduated from high school. This was one of the most inspirational middle-grade stories of a young Canadian girl that I've read. Emily Eaton was born with cerebral palsy. She couldn't communicate except with a few signs and she couldn't control her movements. Although in a wheelchair, her family involved her in everything they did, and she felt loved and supported and part of her community. Emily went to a regular school until the school's committee for students with special needs decided that it would be best for Emily to be in a special school for disabled students.Emily and her parents decided to challenge the decision by taking their case to the Advocacy Resource Centre for the Handicapped (ARCH). In time it went all the way to the Supreme Court and became history-making because the decision affected all who are disabled. 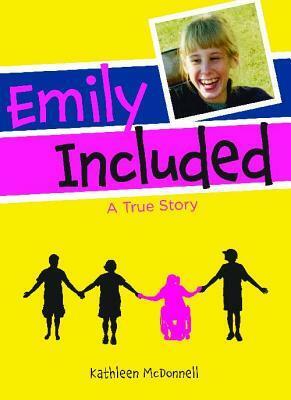 Emily's parents pursued it because they said “it was about the principles of equality and justice for all people with disabilities”.Emily Included is told from the point of view of Emily in the third person. We get to see her world as a child with a bright mind but a body that she could not control. Several times I teared up as I was reading her story. The way her brothers included her in their games or the way the children in school knew what she was trying to say to them because they were her friend and got to know her way of communicating is a testament that, when children are exposed to other children with disabilities, they are comfortable with children who are different. They will not be afraid of someone in a wheelchair who speaks and acts strangely. I saw this firsthand when I worked in a school that included children with disabilities.This book stressed the importance of parents being their child's advocate. I have so much respect for the Eaton family who fought for the rights of their beloved Emily. I think every Canadian school should have this book in their library and it would be a good idea to include it as a part of social studies. Highly recommended. As well written as a book based on a true story and not fictionalized and aimed at younger readers can be. Certainly gets you to feel and experience the pain and special insight that being "differently-abled" can bring. Would be an okay read aloud in class. Brilliant! Thank you Kathleen for loaning Emily your voice! This is an excellent book to learn how it feels like to have cerebral palsy and about an important court case that allowed children with disabilities to attend their neighbourhood school. KathleenMcDonnell - I was born in the U.S. and have lived in Canada most of my adult life. My writing cuts across many genres - fiction, plays, non-fiction, young-adult, you name it. Visit my website to find out more about my books and plays, and for info on my fantasy-adventure trilogy The Notherland Journeys, about a teenage girl with the ability to create imaginary worlds.